The Absolute Breadth Index or ABI for short is a market indicator that is used by technicians in determining the levels of volatility in the market. Unlike other volatility indicators, the Absolute Breadth Index does not factor the market direction. 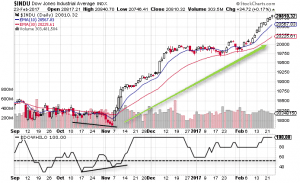 Appropriately, the Absolute Breadth Index is also known as the going nowhere indicator because it does not show which way the market is moving. Developed by Norman G. Fosback, the Absolute Breadth Index was first introduced in a book "Stock market logic" that was authored by Fosback. The Absolute Breadth Index widely finds its use in the stock markets only. The ABI is also known as market momentum indicator and its calculation is relatively simple. The Absolute Breadth Index is based on the advancing and declining issues, two indicators that are readily available to technical analysis and day traders. The ABI shows how much of activity there is in the market via the volatility and shows how much of change is taking place in an exchange such as the NYSE exchange or the NASDAQ exchange. The Absolute breadth index can also correspond to the market sector as well. The ABI is a breadth indicator because it measures the breadth of the market by taking into account the advancing issues and the declining issues. Thus, the output of the ABI is rather simple. What is a market breadth indicator? Contrary as this may sound (to the ABI); a market breadth indicator is used to determine which way the market is moving. To do so, the breadth indicators utilize the advance, decline and unchanged issues. These values are published by the respective stock exchanges and are readily available. The chart below shows the NYSE # of advancing issues and the NYSE # of declining issues (bottom). What these indicators convey is simply the total number of stocks that were advancing or declining on the day. For example, in the below chart, the final reading was 1125 for advancing issues and 1787 for declining issues. Thus, based on these values (as well as the number of issues that did not change) a market breadth indicator can be developed. The breadth is nothing but either the difference between the number of rising and falling stocks, or a ratio or some other derivative. What this tells the trader is the momentum and volatility. When you have a large number of stocks that are rising (advancing) or falling (declining) it indicates higher market volatility or breadth. Market breadth is often referred to as positive breadth or negative breadth. As the name suggest, positive market breadth is where the number of advancing issues clearly outrank the number of declining issues. Likewise, negative market breadth is when the number of declining issues outranks or overwhelms the number of advancing issues. The advancing and declining issues are based on stocks making 52-week highs and/or 52-week lows. This data provides the long term bullish or bearish direction. The market breadth indicator puts the trader on the right side of the market. Obviously you wouldn’t want to buy stocks when clearly the number of declining issues is much higher than the number of advancing issues. Besides the Absolute Breadth index, other market breadth indicators include the famous, advance decline index, the advance decline ratio and so on. The Absolute Breadth Index is calculated as follows. It is important to know that the stock or security that is being analyzed needs to correspond to the exchange in question. It is common knowledge that when the Absolute Breadth Index posts a high, it usually coincides with a market bottom. Similarly, a low reading on the ABI indicates a market top, although such signals are not that common as compared to the market bottoms coming off higher ABI values. Below you can see a split chart. On the left side, we have the stock chart for Visa Inc. (V) and on the right is the QQQ Powershares ETF. Common to both is the Absolute Breadth Index. 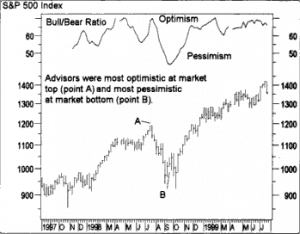 The areas marked by the circles indicate the market bottoms and the relative value of the ABI during that time. In some versions of the ABI indicator, an exponential moving average (EMA) is applied to the ABI as well, in order to smooth out the volatility. When the EMA is brought into the picture, the ABI can be used as a better indicator to spot the market bottoms. The Absolute Breadth Index looks somewhat similar to the advance decline index. The only difference being that it takes into account the absolute values. For example, if the difference between the advancing and declining issues was 300, then the absolute breadth index would show this as 300. However, if the difference was -300, meaning that there were more declining issues than advancing issues, even then, the Absolute breadth index would show 300, because the absolute value of any negative number is positive. In mathematical terms, absolute value is indicated with the | symbol. What we can understand from this is that while the advance decline index can rise and fall around the zero-line, with the Absolute Breadth index, the values are always positive. While the advance/decline indicator is usually applied to the exchange, the ABI on the other hand can be applied to sectors as well. Thus, the Absolute Breadth index is ideal for analyzing the volatility of sectors such as bio technology and so on. According to Fosback, the Absolute Breadth Index can be used to signal ahead of time, the potential price changes in the security or the exchange that is being analyzed. It is important to note that the ABI is ideally used for the NYSE as the values for the advancing and declining issues are easily found. There are also similar indicators for other exchanges such as the AMEX or the Nasdaq. Traders can also build their own absolute breadth index for example such as looking at the number of advancing and declining stocks within a portfolio or within a sector. Historically, higher values on the ABI suggest that prices are likely to rise over the next 3 through 12 month period of time. Fosback also suggests in his book, Stock market logic that there was a higher level of confluence when the ABI was based on dividing the weekly ABI by the total issues that were traded. This meant that instead of using the daily values of the number of advancing and declining issues, a weekly value would be considered. The absolute value would then be divided by the total number of issues that were traded. The final result would then point to higher prices in stocks over the coming three or twelve month period. No matter which way one looks at the ABI, the fact remains that this indicator is suited for long term trading. Thus, stock traders who are familiar with swing trading will find that the Absolute breadth index offers a better view of timing the entries in the market. Let’s look at some examples on how one can use the Absolute Breadth index to enter a trade. In the following chart, we have the daily stock chart for Microsoft (MSFT) and the Absolute Breadth index. We also have a 50 and 200 day simple moving average to depict the trend. After the first bullish crossover of the SMA, the question is where to enter the trade. Based on the ABI value of 3800 which was plotted after the initial bottom was identified by the market, after the bullish crossover of the SMA, we simply wait for the ABI to reach back to the 3800 value. This happens nearly three months later after the golden cross signal, identified by the bottom that was formed. Price initially rallies after the bottom and then slips back to the 200 day SMA. While the declines would have sent investors to remain cautious, the bottom coincides with a somewhat higher reading in the ABI, which would have increased the confidence in the trader. Adding to positions here would have seen prices rally back and the struggle near the previous resistance would have offered enough clues for traders to exit the position. Also note that when price was near this resistance forming a high, the ABI value was also lower which was another signal that a temporary market top was being formed. In the next example, you can see that as price declined, it fell back to the previous support low that was formed. However, this time around, we again see a higher ABI value indicating a market bottom was in place. However, with the 50 and 200 day SMA bearish, we wait for bullish confirmation which occurs around late September. Incidentally, as price makes a small bottom, this is validated by higher ABI value and also the price level is near the previous resistance level. Considering the above factors (bullish SMA, resistance turning to support, higher ABI value), a long position would be a perfect timing. Of course, the trading strategy can be further fine tuned and used alongside timing indicators such as the Stochastics oscillators. The ABI can also be used with chart patterns or even candlestick patterns to confirm the market bottoms and the potential reversals that might occur by taking into account factors such as support/resistance levels, candlestick patterns and confirmation with volume of the security being analyzed as well. Another example of using the Absolute breadth index is combining the indicator with Bollinger bands. 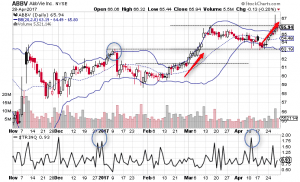 The Bollinger bands indicator is a volatility indicator and therefore fits perfectly well with the ABI. In the next example below, we have the daily stock chart for Twitter with the default Bollinger band settings applied to the chart, alongside the ABI indicator. Here, the market bottoms can be correlated with higher readings on the Absolute breadth index to develop a short term trading strategy. In the above example we have two instances for a long position. In the first, the bottom in the stock is validated by the top in the ABI. Identifying the nearest resistance level, we then take a long position when this resistance is breached. In the second example, a similar set up is formed where the bottom in prices coincides with a top in the ABI. The break out from the previous resistance is marked by a strong rally in prices. From the above two examples, we can conclude that the Absolute Breadth Index is a relatively simple tool that can predict the market tops and bottoms. While this technical indicator might not be that appealing for day traders, it can be definitely be used by long term and swing traders as the indicator is best used on daily charts. Volatility assessment through the absolute breadth index is an unconventional method because traditionally, volatility is measured by monitoring the price change or the rate of chance or the trading ranges that are usually established. Thus, the ABI as a market volatility indicator is rather different compared to the more conventional indicators such as Bollinger Bands or Average True range indicators. 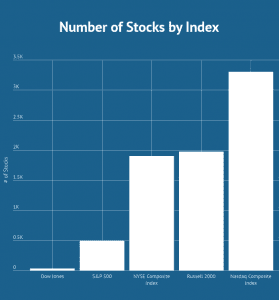 Although the absolute breadth index is used to assess the volatility from an exchange, it can also be used to assess the volatility of a portfolio of stocks or analyzing the advancing and declining stocks in a sub-sector, which makes it unique. Furthermore the fact that the Absolute Breadth Index ignores market direction makes it unique in terms of indicating when volatility is rising or falling.